This Sweet Potato Falafel is a delicious twist on a classic. The sweet potato, lemon zest and raisins give this falafel a unique taste and texture. You can eat in a wrap with salad or with tomatoes, pickles, ripped coriander and lashings of the sesame lemon dressing. 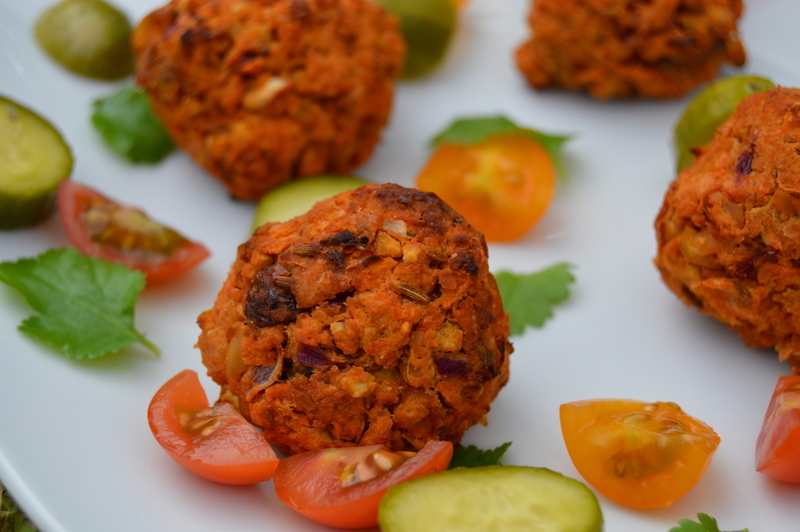 My Sweet potato falafels are naturally gluten free, with no added oil, contain 2-3 portions of fruit and veg. Suitable for a whole foods plant based diet and general healthy diets. The high protein falafels are baked to a golden perfection without any oil. There are some oil’s with a health benefit but these are almost always lost once heated so I avoid adding any oil to cooked food and instead ad it to raw dressings. Just a few natural ingredients are needed to make these healthy falafels. I always add lemon rind and some raisins as they give a beautify complex depth of flavour to the falafel. If you don’t have all the spice you can leave them out but it’s best to always add some cumin and a bit of chilli heat. Whole sesame seeds are ground to make the dressing as it is much fresher than using pre-made tahini (creamed sesame). This is what I call instant raw tahini as its quick and the sesame seeds are not roasted so the fats are still raw and healthy. Almost all shop bought tahini is made from roasted sesame seeds. I recommend using the darker un-hulled sesame seeds as they are nutritionally superior, but if you prefer a lighter tahini then use hulled sesame seeds. You could add a tablespoon of oil before blending the falafel if you prefer, but I try to avoid cooking fats. If you do cook it without any fats it is still delicious but does need something like the sesame lemon dressing as would be dry without it. This falafel is baked unlike many that are deep fried. The pickled gherkins in the photos are my own pickles recipe made in just 24 hours and using apple cider vinegar. They are a healthy alternative to shop bought gherkins and have all the flavour of normal pickles but with way more nutrition. Place all the falafel ingredients together in a blender and pulse for 30 seconds or so until broken up and combined. Roll into about 9 balls of equal size. Place on a non stick tray and bake at 200°c for about 30 minutes until golden. Turn half way through. Mix together all the ingredients for the tahini lemon dressing. Will last for a few days stored in the fridge. Drizzle on the dressing just before enjoying. Bastian love these recipes ! I am going to try the tropical lemon cake, can I substitute buckwheat for anything else? cheers. Thanks, that’s great to hear! 😀 Yes for the tropical lemon cake you can sub it with oats if that’s easier. What equipment do you use to make home made tahini ? Can we make enough and store in fridge for long ? Loveee your explanations as much as the recipes….totally my kinda food. Thank You so much for doing what you do !